“Dos minutos mas…”, our guide Santi called out. But to me, those two minutes seemed like an eternity. I couldn’t catch my breath, my heart was threatening to beat right out of my chest, my stomach hurt and I was dizzy and lightheaded. It took every ounce of strength I had to take another step. Despite Santi’s prodding, I plopped myself down on a rock and put my head between my legs to keep myself from throwing up. 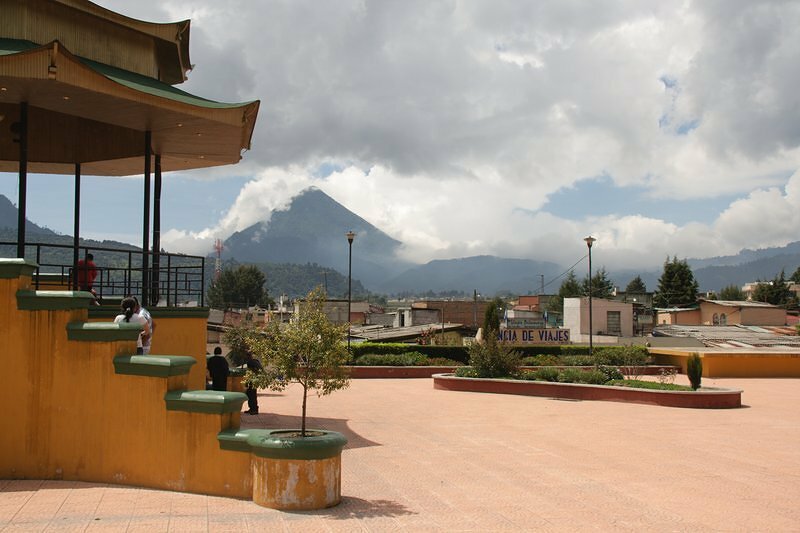 The city of Quetzaltenango “Xela” is surrounded by volcanoes and we couldn’t miss the opportunity to climb at least one of them while we were there. We weren’t totally sure how safe it would be to climb one by ourselves, so we hooked up with a fantastic tour company called Quetzaltrekkers. Quetzaltrekkers is entirely volunteer-run, with 100% of profits going to a local school that the company operates for needy families. Public schools can be expensive to attend in Guatemala, so Quetzaltrekkers pays for the land, the building, the teachers, and the supplies that poor families need for their children to attend school. The volunteers pay for their own food and accommodations (only earning money through tips), so that more money can go to the project. We decided that the volcano for us was Santa Maria. 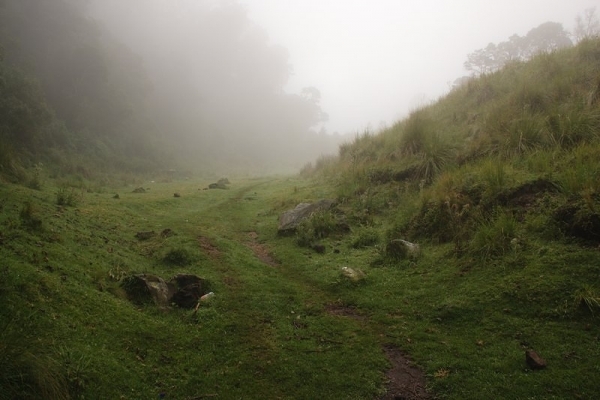 It has an altitude of 3772 m, and there is a lookout over Volcan Santiaguito, which erupts roughly every hour. We paid 250 Q (just over $30 CAD) per person for the full day tour, which meant a 5 a.m. start. 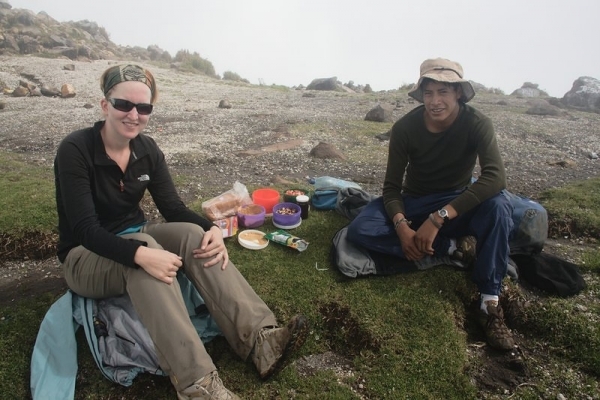 The tour included meals, snacks, and local transportation to and from the volcano. At 5:30 a.m., we arrived at the trail head and started to climb with a dozen or so local Mayans. They do the climb five days a week, and perform religious ceremonies at the summit. 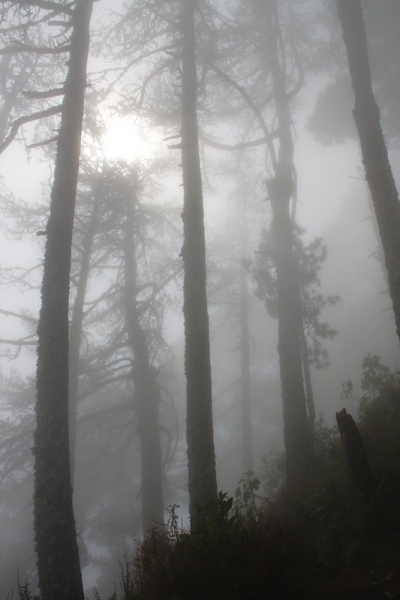 The path was steep and slippery, but we were surrounded by fog and the scenery was beautiful. As we climbed, the fog gave way to clouds and we continued our ascent. Since it was only Mike and I and our guide, Santi, we set a pretty good pace. We stopped about once an hour for a water or snack break, but quickly got moving again. Santi spoke a few words of English, but we spent most of the day conversing in Spanish. He was good about talking slowly and clearly, and there were few words that we didn’t understand. Guess our Spanish classes paid off! The last 45 minutes of the hike were tough. Really tough. Not because the trail got steeper (it was really steep the whole way up), but because my body was rebelling against the high altitude. 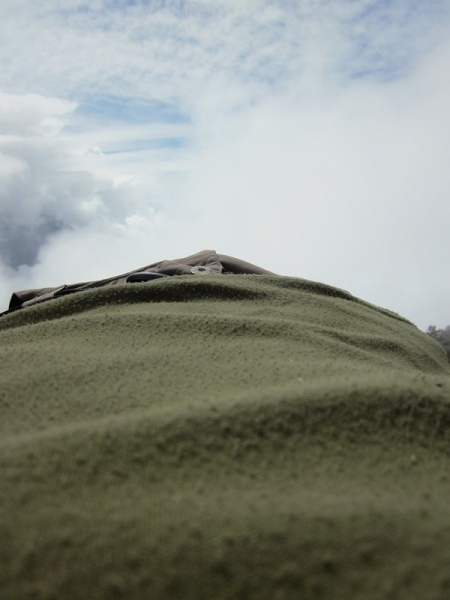 I’ve never really experienced altitude sickness (once, on a mountain in Yellowstone, I noticed it was harder to catch my breath than normal, but I quickly acclimatized), but here it was in full force. I took at least 10 breaks in the last 45 minutes, and the last “two” minutes took more like ten. But I got there. And I celebrated by sitting down on grassy spot and watching the cows. Yep, that’s right… cows. 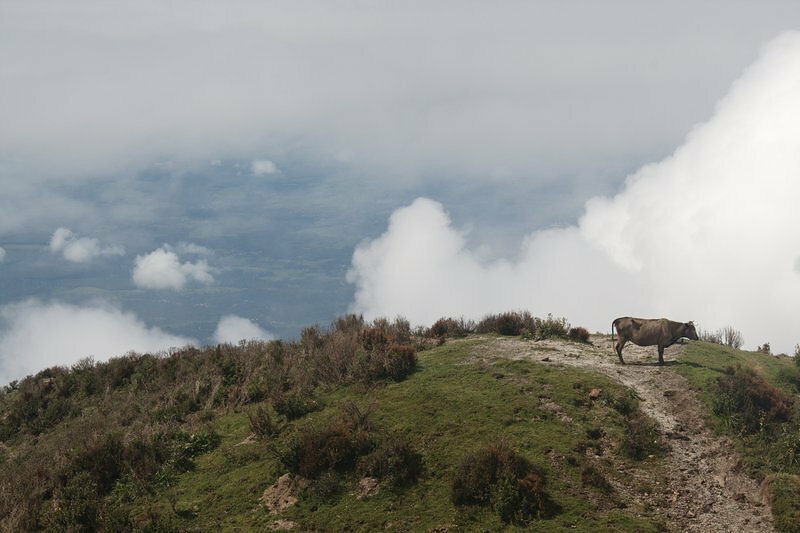 It was so cloudy, the only thing we could see at the summit were the cows on an adjoining peak. Santi told us that there was no way we would see Santiaguito erupt in the dense clouds. Four hours of climbing for what? Cows? Maybe it was the altitude sickness still messing with my head, but I didn’t mind. Of course, I would have liked to see Santiaguito blow its lid, but the summit of Santa Maria was still spectacular. It truly felt like a sacred place… surrounded by clouds, and the sounds of Mayan singing and religious chanting, it was magical. We rested for about an hour at the summit, enough time for my stomach to settle so I could enjoy the lunch Santi brought. It was actually a feast… bread, tortillas, homemade peanut butter, homemade jam, boiled eggs, beans, tomato salad, and trail mix. It was here that I discovered a PB & J sandwich is actually a MM & M sandwich en español. Who knew? As we descended, I just kept feeling better and better and better. The altitude sickness wore off, and I could use the full powers of my concentration not to slip on the wet rocks on the way down. 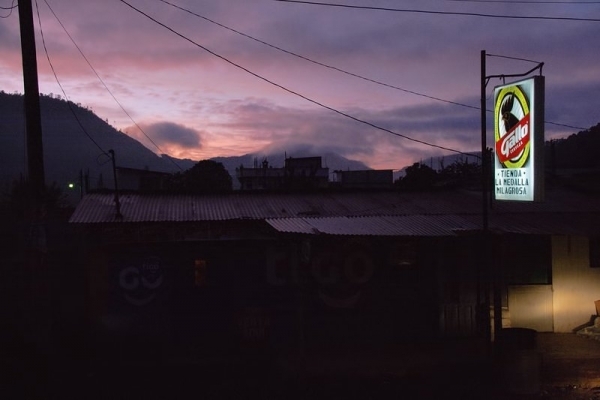 It took us about 2 1/2 hours to climb down the mountain, and a short chicken bus ride later we were back in town. Knowing what we know now, we could have done the hike by ourselves without a problem. There didn’t seem to be any security issues on the mountain. But for once, we didn’t mind forking over a bunch of money to this tour company because we knew we were making a difference just by taking a hike. Way to go Ashley!! Love the photos.